Our range of Stainless Steel Inclined Screw Conveyor is compact and can easily be mounted horizontally or inclined. 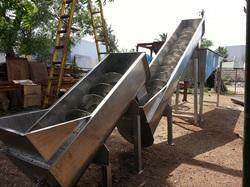 Our offered conveyors are developed by us in mild & stainless steel construction. We have constantly been upgrading our manufacturing process with the aim to provide one of the best quality conveyors to our clients. We are the leading manufacturer and supplier of Stainless Steel Inclined Screw Conveyor in Tamilnadu, Kerala, Coimbatore, Tirupur, Karur, Salem, Chennai etc. Keeping in the mind various requirements of our clients, we are offering premium quality U type Stainless Steel Screw Conveyor that is used in packaging industry. The trough section can be U-shaped or tubular and one or more outlet spout can be placed, according to the customer's needs. Furthermore, our highly knowledgeable quality controllers check it on various quality parameters in order to offer best quality product our clients. We are engaged in offering quality range of Stainless Screw Conveyor in compliance with the international products. All our products are developed using quality approved raw material as per international quality guidelines. Offered product range is acclaimed for high tensile strength and has efficient adhesion. They convert a variety of regular or irregular shaped products from light to medium loads. We are the leading manufacturer and supplier of Stainless Screw Conveyor in Tamilnadu, Kerala, Coimbatore, Tirupur, Karur, Salem, Chennai etc. Backed by the years of experience and knowledge, we are engaged in offering a wide range of Stainless Steel Screw Conveyor with Steaming Tunnel. Made as per the standard configurations predefined by the industry the offered conveyor range has been widely demanded at major industries. Due to its supreme strength and durability, it is highly admired in the industry. We are an eminent manufacturer and supplier of the broad assortment of Stainless Steel Screw Conveyor that are widely used in various industrial applications. We have fabricated it with the finest class mild steel and stainless steel obtained only from the certified vendors of the industry. This can be used in places where using a single screw conveyor is not possible. 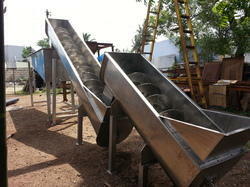 As it is a sequence of conveyors, it has certain advantages over a normal one.